Yoga is a healing system of theory and practice. It is a combination of breathing exercises, physical postures, and meditation that has been practiced for more than 5,000 years (or so Wikipedia suggests). All I know about yoga is how I feel after taking a class at the neighborhood Bikram (hot) yoga studio- kind of rubbery and free from just about every emotion except relaxation. I've tried about a hundred different yoga DVD's (you know, the at-home-yoga stuff) and just can't get into it; I get distracted by the dust around my tv stand, or the dogs need to go out, or my sun salutations just can't get the proper reach when I'm trying to avoid smacking my husband in the face-- I need to have a structured class and an instructor to really keep me focused. Enter Candace. She has been practicing yoga for more years than I care to state (for her sake) and is so experienced, that she can even save herself from a dance floor fall with a yoga move and STILL look fabulous (in a formal gown, no less...). As she begins to embark on the next avenue of her life, she has decided to start her own establishment of yoga instruction- teaching fellow yogis and yoginis about the practice of yoga to help enrich their lives as it has hers. These business cards are just a small way for me and Gable to help her in those dreams. "Cougar Yoga is learning to love yourself and trust your power through the practice of yoga. Cougars take a leap of faith and by doing so find themselves flying towards their dreams." 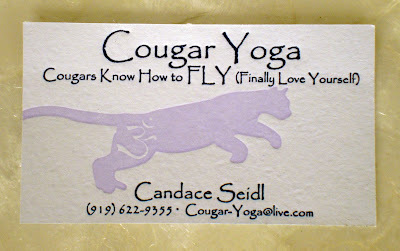 For questions and availability of classes/instruction, eMail Candace at Cougar-Yoga@live.com.